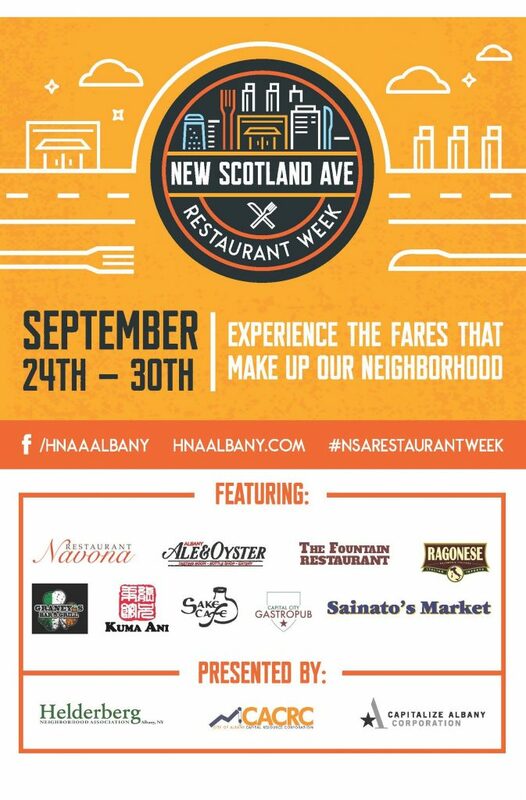 The Helderberg Neighborhood Association will be partnering with local restaurants on New Scotland Ave between Monday September 24th and Sunday September 30th for its first ever restaurant week. Supported by the Amplify Albany Grant Program, a program made possible by the City of Albany Capital Resource Corporation, this event support’s the Association’s work to showcase each of the commercial district’s restaurants’ unique abilities and fare. Restaurants participating include Navona, Sake Cafe, The Fountain, Kuma Ani, Capital City Gastropubtropub, Graney’s, Ale & Oyster, Sainato’s Deli & Catering and Ragonese Italian Imports. Click here to learn more. © 2019 Capitalize Albany Corporation. All Rights Reserved.